"The Sabanes-Oxley Act has been one of the most significant developments in corporate and securities regulation since the New Deal. 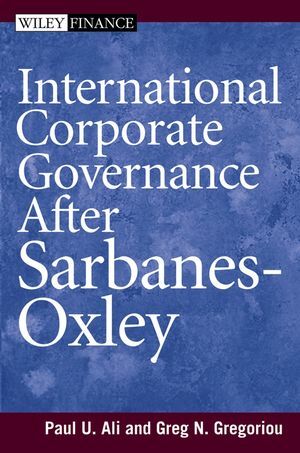 This collection of important articles would be a valuable resource for anyone seeking to understand Sabanes-Oxley's far-reaching effects on corporate governance in the United States and elsewhere." "The editors have assembled the latest cutting-edge research on international corporate governance by respected academics in this field. In this handbook, the editors deal with all aspects of the significant legislative changes to corporate governance regulation. It introduces the reader to the new rules that will certainly improve the reliability and the accuracy of disclosures made by corporations. The book comes at the right moment with the recent scandals such as Enron, which will educate all readers especially shareholders of corporate stock." 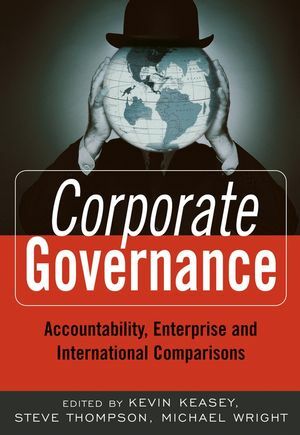 "Today, corporate governance is a topic at the center of public policy debate in most industrialized countries. The range of concerns; the variety of approaches; and their tendency to converge in some areas or diverge in others (not always in the right directions) are emphatically demonstrated by these essays. There is material here of enormous interest for scholars of comparative law and economic regulation. And significantly, the presentation of essays from legal, financial, and regulatory viewpoints demonstrates the growing practical as well as theoretical utility of interdisciplinary work in this area. Professors Ali and Gregoriou are to be warmly congratulated for their skill and initiative in assembling an important publication, as well as for their own contributions to interdisciplinary scholarship." "This very international collection emphasizes the economic line of descent, while including legal and socio-legal contributions. It fills a very important gap in our empirical knowledge of corporate governance. It is accessible and comprehensive and will greatly assist readers from all relevant disciplines, who are trying to discern the shape of corporate governance as a mature field." Paul U. Ali is an Associate-Professor in the Faculty of Law, University of New South Wales, Sydney, Australia. Paul was previously a lawyer in Sydney, specialising in corporate finance, securitization and structured finance. He was part of the corporate advisory team that advised the Australian Mutual Provident Society, the largest Australian life company, on its demutualization and the reconstruction of its group, and the IPO of a new holding company, AMP Limited, on the Australian and New Zealand Stock Exchanges in 1998 (the then largest IPO ever in Australia). Paul has published several books and articles, including articles on finance law in Derivatives Use, Trading and Regulation, Journal of Alternative Investments, Journal of Banking Regulation and Journal of International Banking Law and Regulation, and, most recently, has co-edited a book on innovative securitizations (Securitisation of Derivatives and Alternative Asset Classes, 2005). He holds a SJD from the University of Sydney. Greg N. Gregoriou is Associate Professor of Finance and coordinator of faculty research in the School of Business and Economics at State University of New York, College at Plattsburgh. He obtained his PhD (Finance) from the University of Quebec at Montreal and is the hedge fund editor for the peer-reviewed journal Derivatives Use, Trading and Regulation published by Henry Stewart Publications based in the U.K. He has authored over 40 articles on hedge funds, and managed futures in various US and UK peer-reviewed publications, including the Journal of Futures Markets, European Journal of Finance, Journal of Asset Management, European Journal of Operational Research, and Annals of Operations Research. This is his fourth book with John Wiley & Sons. PART ONE: FRAMEWORK OF CORPORATE GOVERNANCE. Chapter 1. The Ethics of Corporate Governance: What would the Political Philosophers Say? (Colin Read). Chapter 2. The Politics of Symbolism: Sarbanes-Oxley in Context (Justin O’Brien). Chapter 3. Governance and Performance Revisited (Øyvind Bøhren and Bernt Arne Ødegaard). Chapter 4. Corporate Governance as a Process Oriented Approach to Socially Responsible Organizations (Marijan Cingula). Chapter 5. The Impact of the New Corporate Governance Code on the Belgian Stock Market (Albert Corhay, Andree Dighaye and Pierre-Armand Michel). PART TWO: CORPORATE GOVERNANCE AND THE GLOBAL FINANCIAL MARKETS. Chapter 6. Corporate Governance of Hedge Funds (Robert Christopherson, Greg N. Gregoriou and William R. Kelting). Chapter 7. Corporate Governance Reform in Australia: The Intersection of Investment Fiduciaries and Issuers (Martin Gold). Chapter 8. Corporate Social Responsibility and Fiduciary Investment in Australia (Paul U. Ali). Chapter 9. Issuers’ Liability for Financial Information as an Instrument of Corporate Governance Enforcement (Clemens Völkl). Chapter 10. Investing in Death/Speculating on Mortality: Some Thoughts on Life Insurance Securitization (Paul U. Ali). PART THREE: SHARE OWNERSHIP AND SHAREHOLDER CONTROL RIGHTS. Chapter 11. Ownership Structure Metrics (Stefan Prigge and Sven Kehren). Chapter 12. The Effectiveness of Shareholders Meetings: An Overview of Recent Developments (Gregory F. Maassen and Darrell Brown). Chapter 13. The Market for Corporate Control and the Implications of the Takeover Directive (2004/25) (Blanaid Clarke). PART FOUR: ACCOUNTABILITY OF DIRECTORS AND EXECUTIVES. Chapter 14. Board Power Relations and the Impact of the UK’s Combined Code on Corporate Governance (Timothy J. Nichol). Chapter 15. CEO Compensation in Australia’s Largest Companies (Geof Stapledon). Chapter 16. Directors’ and Officers’ Liability in France (Alain-Xavier Briatte and Michael Julian). Chapter 17. Independent Directorship Systems in Greater China (Margaret Wang). PART FIVE: RESPONSIBILITIES TO STAKEHOLDERS, AND OTHER EMERGING TRENDS IN CORPORATE GOVERNANCE. Chapter 18. The Primary Stakeholder Relationships: Corporate Governance and Value Creation (Andrea Beretta Zanoni). Chapter 19. Family Ownership and Corporate Governance (María Sacristán-Navarro and Silvia Gómez-Ansón). Chapter 20. The European Social Model of Corporate Governance: Prospects for Success in an Enlarged Europe (Irene Lynch Fannon). Chapter 21. Contract Negotiation and Internal Regulation Mechanisms in a Firm (Hubert de La Bruslerie). Chapter 22. Prospects and Limits of Corporate Governance Codes (Björn Fasterling). Chapter 23. Assessing the Effectiveness of Boards of Directors and Individual Directors (Richard Leblanc).